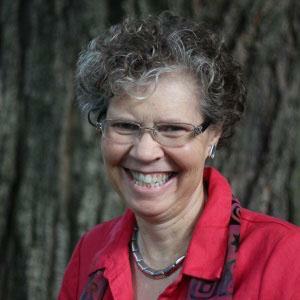 April RIF of NOVA News! MARK YOUR CALENDARS FOR UPCOMING RIF OF NOVA EVENTS!!! June 8: Do More 24 -- 24 hours to give to your favorite non-profit...RIF of NOVA! How about a dollar an hour for 24 hours...$24 = 12 books for children who need them most in our community! Or $2 an hour...$48 = 24 books. For more information about this area-wide campaign sponsored by the United Way of the National Capital Area, please click here. And mark June 8 -- starting at 12:01 am through 11:59 pm -- on your calendars! Yes! It's back! 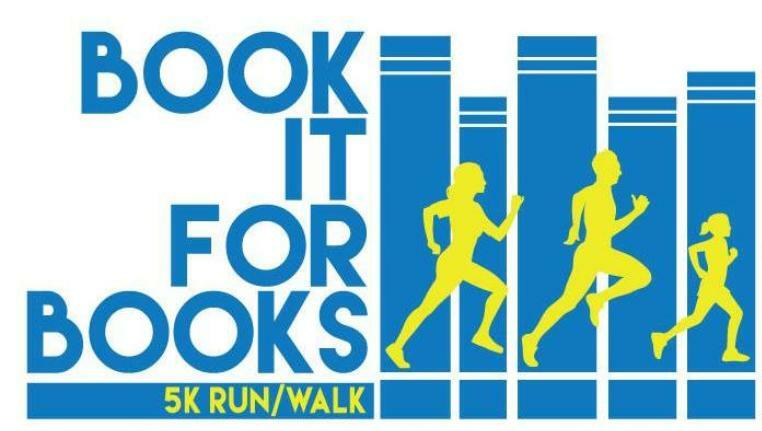 Our second annual Book it for Books 5K/1 Mile run walk. The date: Sunday, October 29 at Bluemont Park in Arlington. It's right before Halloween so children (and parents) are encouraged to wear costumes, particularly if they represent a beloved book character! Details to come, but please save the date! WHY PARTICIPATE IN RIF OF NOVA EVENTS? Because there is a literacy crisis in America...and in parts of our area, too! Did you know that summer learning loss alone prevents many young people from learning how to read, contributing to the $225 billion annual cost of illiteracy in the United States. That's BILLION with a B. Yikes. RIF of NOVA is fighting back by distributing books to some of Northern Virginia's neediest children. Please find photos of some of our spring book distributions below!!! 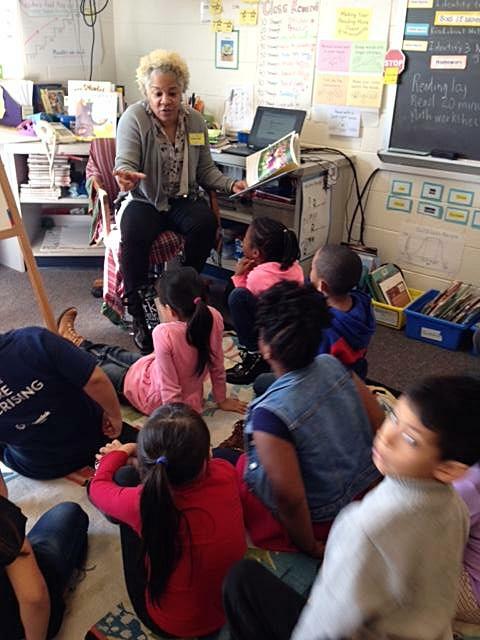 Melissa Hinkson, RIF of NOVA board member and Hoffman-Boston Elementary School (Arlington) liaison, read to Mrs. Leikvold's second grade class. Melissa is also RIF committee chair for the Northern Virginia Alumnae Chapter of Delta Sigma Theta Sorority which has supported RIF of NOVA through the years. Woodley Hills Elementary School (Fairfax County) students dressed as their favorite book characters for Read Across America Day. This first grader from Woodley Hills dressed as Little Red Riding Hood. She and her friend showed big smiles as they posed by the RIF of NOVA book table. 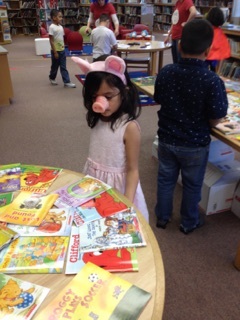 This little miss from Woodley Hills Elementary looked discerningly at a panoply of good books from which to choose! Read Across America Day in March was just the most fun ever! 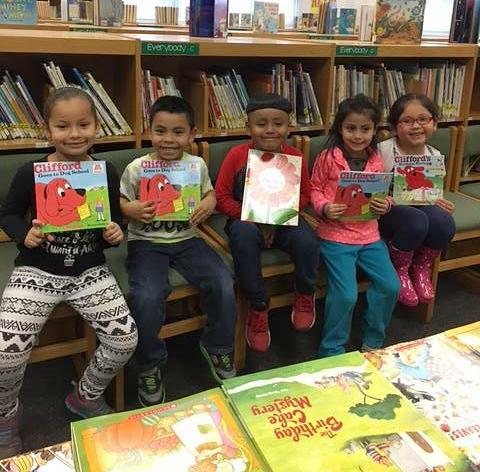 Hutchison Elementary School in South Riding (Fairfax County) held its RIF of NOVA book distribution just before spring break! Boy, were these kids excited! Just look at this happy face! 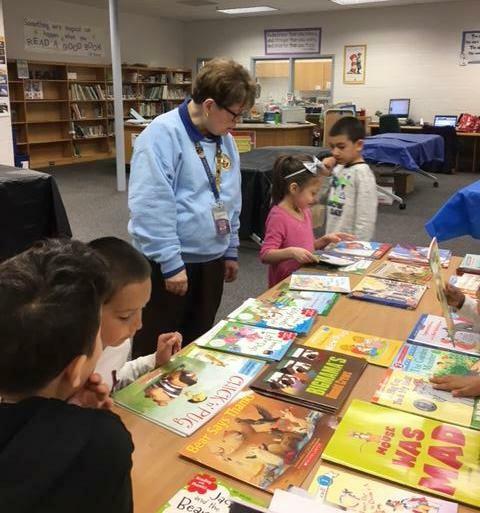 Elaine Maloney, Hutchison librarian and RIF of NOVA liaison, helps these kindergartners with their book selections. Elaine will retire in June after 22 years. Congratulations and thank you!!! 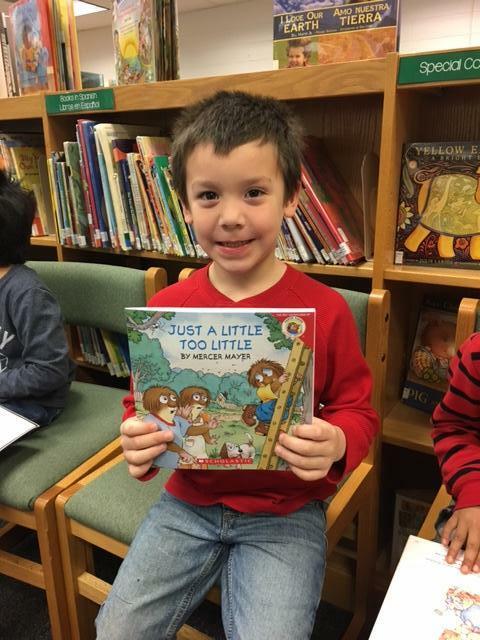 Hutchison kindergartners lined up with their new RIF of NOVA books. What fun to have a new book to read over spring break! "I am an 8th grader at Cooper Middle School in Fairfax County, and we have to do 15 service hours. For my project, I chose to do a book collection of elementary and middle school level books for Reading is Fundamental of NOVA because there are a lot of kids in our area who do not have books to read. Before winter break, I collected 200 books and organized them by categories like early reader, fantasy, adventure, historical fiction, mystery, and non-fiction. I hope these books give the kids joy and let them go on adventures in their mind with the characters they read about in these books." 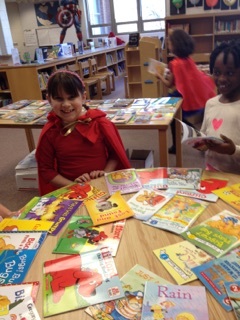 Jillian Barto poses by a table of books at Barcroft Elementary School (Arlington) for Read Across America Day. Thank you, Jillian! Your service project is making a real difference to kids in our programs who want to read!!!! 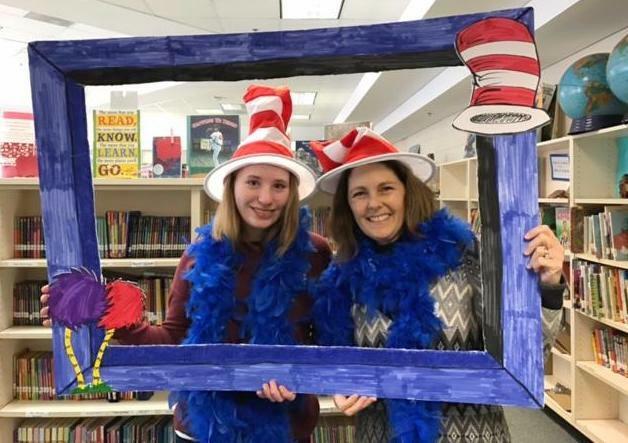 Jillian Barto and Justina Johnson Head, RIF of NOVA co-president, celebrate Dr. Seuss Day at Barcroft Elementary. 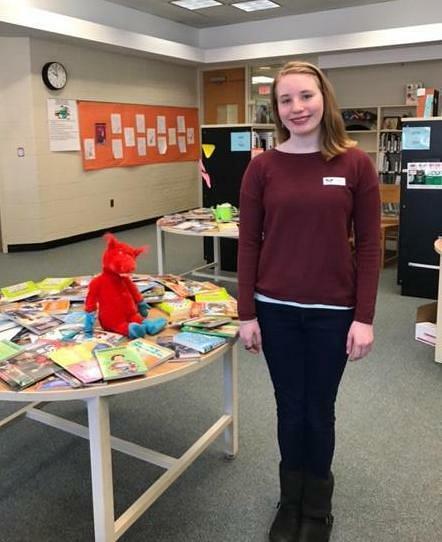 In addition to reading to the children, Jillian gave several of the books she collected to children at Barcroft. She plans to give the rest to other RIF of NOVA schools. Book Sale at Mason Library -- April 28-30! The Friends of the George Mason Regional Library will co-host its semi-annual book sale on Thursday, April 27 from 3:00 to 9:00 p.m.; Friday, April 28, from 10:00 a.m to 6:00 p.m.; Saturday, April 29, from 10:00 a.m. to 5:00 pm; and Sunday, April 30 from 12:00 p.m. to 5:00 p.m. Books for all ages, music CDs, videos, audio books, and rare books are featured. Where: 7001 Little River Turnpike, Annandale, VA. For more information, call 703-813-6616 or visit: http://georgemasonfriends.blogspot.com/. First place winners at each grade level will have their stories made into a hardcover book! Additionally, the local class, after-school, or child care center that submits the most entries to WETA Kids will win a free classroom library of children’s books and a visit from a famous PBS character! All entries must be postmarked by May 1, 2017. Learn more here. The Children’s Book Guild of Washington, D.C. will honor author Ann Bausum on April 29 with its venerable Nonfiction Award. Bausum’s books have earned numerous literary awards including a Sibert Honor Award, the Jane Addams Children’s Book Award, the Carter G. Woodson Award (on two occasions), and the Society of Children's Book Writers and Illustrators Golden Kite Award. 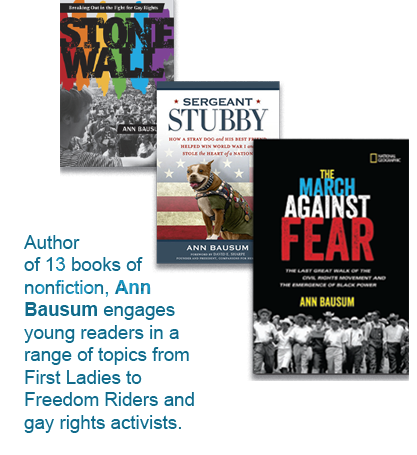 Ann Bausum's newest title, The March Against Fear (National Geographic 2017), is her third work to examine the civil rights movement in the American South. Bausum strives to bring the nation’s social justice history to life, exploring such topics as gay rights, voting rights, immigration, and free speech. When and where: Saturday, April 29, 2017, 12 pm to 3 pm, Clyde's Restaurant of Gallery Place, 707 7th St., NW, Washington, DC. For tickets, go to: https://www.facebook.com/events/199159350567115/. Help give the gift of literacy right now! How? P lease share the RIF RAP! Forward our newsletter to your friends and anyone interested in providing books to children who need them! Subscribe here!